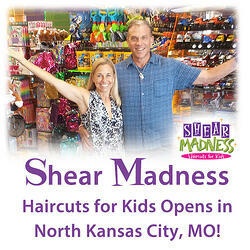 Shear Madness Haircuts for Kids Opens in North Kansas City / Liberty, Missouri! Are you looking for an awesome experience that combines the magic of childhood with haircuts, parties, salon services and a fantastic kids boutique filled with toys, hair products, jewelry and more? If so, there’s a new salon in town that promises to help you transform the scary experience of getting your kids’ haircut into a fun one! The end result is a happy child with a great haircut, and a memorable experience everyone will be talking about for days to come! This growing hair salon for kids opens their newest location in Liberty/Northland at 8261 North Booth Ave and Hwy.152 in August. The answer to harried haircutting experiences, Shear Madness Haircuts for Kids offers great haircuts and ear piercing for children while they sit in little cars and watch their favorite programs on flat-screen TVs or play video games! There are also normal chairs for older kids and adults who would like to get a haircut. And don’t forget that Shear Madness offers kids parties for your special occasions, as well as a great kids boutique filled with a unique selection of toys, hair products, hair bows, jewelry & more! “I'm thrilled to bring the Shear Madness experience to the Liberty/Northland area, and offer the same great service to our customers in North Kansas City that we do in Olathe and Lees Summit. Our store not only helps facilitate a magical and memorable experience for your child, but also helps turn the necessity of a haircut into extraordinary fun," said Janon Otto, CEO of Shear Madness Franchising and local franchise owner. "Moms, dads and also grandparents can feel good about visiting us. There is now a special place for Kid's haircuts! No need to worry that your child may not behave as you would like! We LOVE that any child with special needs we can accomodate them and make them feel special. We also try so hard to fill the toy portion of our store with items that are unique and fun to play with! Hoping that your children will enjoy them, and that you may find an easy quick place to pop in and pick up a gift. Shear Madness also carries styling and hair care products not found elsewhere that are specially designed with the health and needs of kids in mind. We also pride ourselves in having the best selection of hair bows, etc. in the city!" Shear Madness Haircuts for Kids locations are currently open in Kansas, Missouri, New York, Iowa, Texas, California and New Mexico - with expansion into other states planned for the near future! Shear Madness Haircuts for Kids in the Liberty/Northland area will be open seven days a week, Monday through Friday from 10 a.m. to 7 p.m., Saturday from 9 a.m. to 5 p.m. and Sundays from noon to 5 p.m. For more information on Shear Madness, or to schedule an appointment, please visit our website at www.shearmadnesskids.com. August 2017 Newsletter: Back to School Hairquarters! Look and feel your BEST for Back to School! In just a few short weeks, kids everywhere will be heading back to school! Are you ready for the latest styles? With our great stylists, Shear Madness Haircuts for Kids can help your kids look and feel their very best for a new school year with cool new hairstyles, awesome hair care products, jewelry, a fantastic bow selection and so much more. Be sure to book early, as appointments always go FAST at this time of year! Hairbows for Back to School! If you're ready for something a little special for heading back to school, why not check out our awesome hair bows? We have a HUGE selection! From tiny baby bows to special occasion bows, huge headbands with bows and more - Shear Madness has something for everyone! And right now at participating locations, if you buy any bow - you get a Bling item for 99 cents, with coupon. WOW! Read more here! Kids Model Contest 2017! Here's your chance to be a madtastic Shear Madness Model! 10 lucky winners will be chosen for each of the Humble Texas and Lake Forest California Shear Madness Haircuts for Kids locations, and included in a funtastic photo shoot! Now until Sept 22 at midnight (2017). Enter to win! (If you know someone who would love to participate from these areas, be sure to let them know!) Official rules and information right HERE! A Kids Hair Salon Where Every Child Matters! We are Growing! Did you know that Shear Madness Haircuts for Kids will be opening new locations in North Kansas City, Missouri and Orchard Park, New York? That's right! And if you or someone you know would like to learn more about the many awesome franchise opportunities available with Shear Madness Franchising, just click on Franchise Opportunities to get started! Meanwhile, if you are interested in our other free resources for businesses, or would like to learn more about how to become a successful owner of your own franchise business, check out our blog or call 1-888-98 GONE MAD! Model Contest, Coupons and MORE! Your Chance to Be a STAR! Don't miss out on the great customer feedback and photos on our social media sites, and our amazing model contest going on right now! To participate, simply click on Model Contest! And if you'd like to share some cool photos of your Shear Madness experience, just click Facebook, Instagram, Tumblr, Google+ or Twitter to get started! Meanwhile, don't miss out on some of our favorite Shear Madness pins this month on Pinterest! Plus, if you want even more Shear Madness info, how about checking out our Franchise Blog! Our August Coupons are HOT! Wow! Here's some great deals that you won't have to wear sunscreen for! For example, one of our amazing coupons for the month of August is for a FREE Bowdacious Bow, Headband and Bling items if you book your September Birthday this month! Don't miss out! Be sure to head over to our coupon page for this and other sizzling savings! Get ready for some Summertime FUN! If you're looking for a few ideas on how to make it a memorable summer vacation before the kids head off to school, then don't miss our Crafts for Kids section on Pinterest! Check out how to make a great school bus picture frame out of craft sticks (as seen at right), clothespin cars, cute bee finger puppets, a cupcake liner octopus, ocean starfish made out of buttons, q-tip daisies, ocean crabs made from paper plates and giant paper popsicles! Have a great rest of your summer! September 2016 Newsletter: Special Memories at Shear Madness! Get one FREE First Haircut Special! Your child's first haircut is a special occasion. That's why right now you can buy a First Haircut Package, and get one FREE photo certificate for the grandparents! Which means not only will you receive a before and after picture on a cool certificate and a keepsake scrapbook page - but you'll also get a 1/2 sheet grandparents First Haircut Certificate, regularly priced at $5! Make sure to call for an appointment, as these take twice as long as a regular haircut! Note: Available all month long at participating locations. WOW! Back to School Pictures! Are you ready to look and feel your best for school pictures this month? If so, make sure that you stop by Shear Madness Haircuts for Kids for an awesome refresher! We have great stylists who can help you achieve that cool hair style you're looking for. 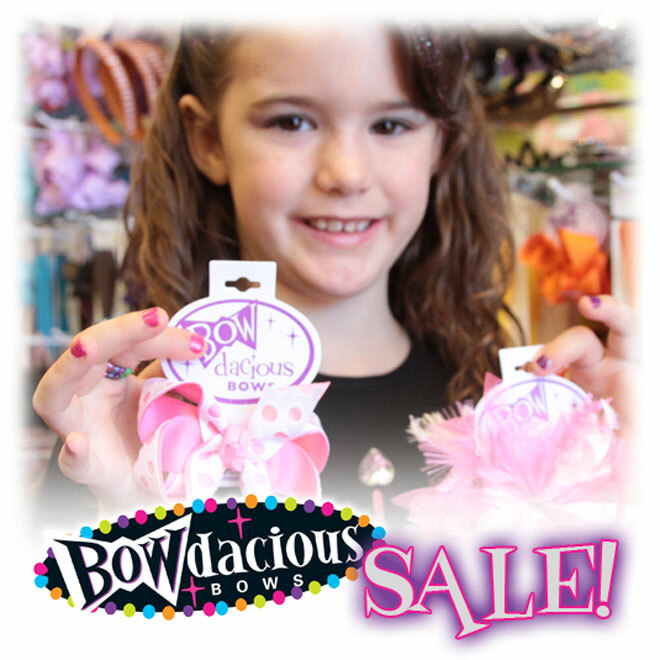 And don't forget, we also have a TON of cool hairbows to match any outfit, hair products, great items for party gifts and much more (with a coupon this month for a buy one Bowdacious Jewelry item, get one 1/2 off right here!). So make an appointment today to get ready to look and feel your best! Knock your Locks Off Annual Event! Knock your Locks Off is an annual event sponsored by Shear Madness Haircuts for Kids that helps provide hairpieces to kids under age 21 suffering from long-term medical hair loss from any diagnosis. Scheduled for the weekend on October 8th and 9th (details vary by participating locations), Shear Madness locations will donate to Locks of Love or Wigs for Kids (click prior links for hair requirements)! Plus, participants will not only get a FREE Haircut by one of our Madtastic Stylintists who is donating her time, but also receive a keepsake certificate featuring a before and after photo! Check out the Shear Madness website for more information about this cool way to help others. And be sure to call for details and to schedule your appointment for this special occasion! Shear Madness is coming to California & Houston! Shear Madness is opening new locations in California and Houston this fall! 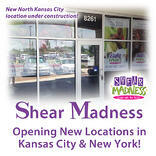 Shear Madness continues to expand and locations may soon be opening near you! The two newest members of our family are opening up in Orange County California in the Lake Forest – Irvine area and Houston Texas in Humble – Kingwood this fall. You can learn more about our Shear Madness news in California by clicking here! Also, if you're interested in learning more about running a business, or franchise opportunities with Shear Madness Haircuts for Kids, check out our Franchise Toolkit to get started! Plus, if you're interested in our other free resources for businesses, or would like to learn more about how to become a successful owner of your own franchise business, check out our blog or call 1-888-98 GONE MAD! Super Savings & Fantastic FUN! Shear Madness Social Media! If you're looking for a little something extra to help add a little fun to your life, why not check out our social media pages right now on Facebook, Instagram, Google+ or Twitter? We've got funny jokes for kids, special sales, cool stuff going on in our awesome stores, great photos and tons of other fantastic stuff! Plus, don't miss out on some of our favorite Shear Madness pins this month on Pinterest! And don't forget, our Franchise Blog is always home to many great topics to help you succeed! Back to School Savings! With school having started for many kids across the nation, we understand how all the new clothing, shoes, and school supplies can add up pretty fast! So that's why we've put together some really great coupons to help you save! For example, right now with coupon, if you book a party for 8 guests, the 9th guest is free (at participating locations)! WOW! So don't miss out, and head over to our coupon page for this and many other awesome savings! These Kids Crafts are COOL! Awesome Crafts for Kids! Kids and adults both are sure to have a lot of fun checking out our hand-picked selection of Crafts for Kids section on Pinterest! Learn how to make some super cute sea creatures made from toilet paper tubes (as seen at left), funny monsters from tissue boxes, popsickle stick airplanes, crazy emoji magnets, decorative paper rosette birds, animal pencil toppers made from felt, paper plate dinosaurs, amazing "fire-breathing" dragons, cool alien spacecraft made from plastic cups and LOTS of other AMAZING stuff that you can make! Check it out and make some special memories today! August 2016 Newsletter: Back to School Hairquarters! Look your Best for Back to School! In just a few short weeks, kids everywhere will be heading back to school! Are you ready for the latest styles? With our great stylists, Shear Madness Haircuts for Kids can help your kids look and feel their very best for a new school year with cool new hairstyles, awesome hair care products, jewelry, a fantastic bow selection and so much more. Be sure to book early, as appointments always go FAST! Bows for Back to School! If you're ready for something a little special for heading back to school, why not check out our awesome hair bows? From tiny baby bows to special occassion bows, huge headbands with bows and more - Shear Madness has something for everyone! And right now at participating locations, if you buy any bow - you get a Bling item for 99 cents, with coupon. WOW! Read more here! Are you interested in learning how YOU can help make a positive difference in the lives of children and their families by joining the Shear Madness Haircuts for Kids family? Would you like to learn more about how to run your own Shear Madness Haircuts for Kids? If so, we are one of the fastest growing kids hair salons and franchise systems in the industry today! Don't miss out on our many free resources available to help pass on our extensive knowledge on franchising, running a business, and more! Click on Franchise Opportunities to get started. Also, make sure to check out our other free resources for business, as well as learning more about how to become a successful owner of your own franchise by checking out our blog or by calling 1-888-98 GONE MAD! Savings and An Around-the-Clock Party! We're Having a Blast on Social Media! You can count on Shear Madness to ALWAYS be up to something really great on Social Media, whether it be funny jokes for kids, awesome customer feedback, great photos and so much more! And best of all, this round-the-clock party is happening right now on Facebook, Instagram, Google+ and Twitter! 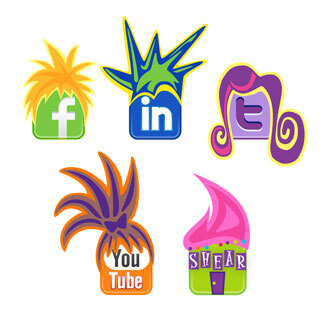 Meanwhile, don't miss out on some of our favorite Shear Madness pins this month on Pinterest! Plus, if you want even more Shear Madness info, how about checking out our Franchise Blog! HOT, HOT, HOT August Coupons! If you've been looking for some savings on gifts for upcoming birthday parties or another fantastic special occassion, our August coupons are so HOT, you might need to put on a pair of sunglasses before checking them out! For example, one of our coupons is for a FREE Bowdacious Bow, Headband and Bling items if you book your September Birthday this month! So, be sure to head over to our coupon page for these sizzling savings! A FUN Summer with these Kids Crafts! These Summer-themed Crafts are Cool! If you're looking for some great ideas on how to make a few more special summer vacation memories before your kids go back to school, don't miss our Crafts for Kids section on Pinterest! Learn how to make wind spinners out of your old CDs (as seen at left), rocks painted to look like turtles and fish, balloon tennis, a cool DIY kaleidoscope, sponge sailboats, giant bubbles, an outdoor tic-tac-toe game, fun gummy worm popsicles and tons more great ideas! August Newsletter: Back to School Hairquarters! Back to School Appointments are going FAST! It's hard to believe, but the back to school countdown has begun! Are you ready for the latest styles? With our great stylists, Shear Madness Haircuts for Kids can help your kids look and feel their very best for a new school year with cool new hairstyles, awesome hair care products, jewelry, a fantastic bow selection and so much more. Be sure to book early, as appointments for back to school haircuts always go FAST at this time of year! Bows for Back to School! At Shear Madness, we have so many hairbows to choose from, it's sure to be an experience you'll want to come back for again and again! From tiny baby bows to special occassion bows, huge headbands and bows and more - we have something for everyone! And right now at participating locations, if you buy any bow - you get a Bling item for 99 cents, with coupon! Read more here! Locks of Love Annual Event! Our Annual Locks of Love Event is scheduled for Sunday evening, September 27th! Participants will not only get a FREE Haircut, but also receive a keepsake Locks of Love Certificate featuring a before and after photo! Check out the Locks of Love website, and the Shear Madness website for more information about Locks of Love. And be sure to watch for further details about this event coming soon! Did you know that Shear Madness Haircuts for Kids recently signed an Area Development Agreement for multiple locations in New York State, Pittsburg, PA and Cleveland Ohio? If you are someone who would like to learn more about the many awesome business opportunities available with Shear Madness Franchising, don't miss our many free resources available to help pass on our extensive knowledge on franchising, business growth, and more! Click on Franchise Opportunities to get started. If you are interested in our other free resources for businesses, or would like to learn more about how to become a successful owner of your own franchise business, check out our blog or call 1-888-98 GONE MAD! Keeping it Cool on Social Media! Shear Madness is always up to something COOL on Social Media, whether it be a chance to win on FREE Haircut Fridays or funny jokes for kids, to awesome customer feedback, our monthly newsletter, great photos and much more! And best of all, the party is happening right now on our Facebook page, Franchise Blog, Instagram, Google+ and Twitter! And don't miss out on some of our favorite Shear Madness pins this month on Pinterest! HOT August Coupons! If you've been looking for some great special sales to save on gifts for upcoming birthday parties or another special occassion, our August coupons are so HOT, you just might need to put on a pair of sunglasses before you check them out! Head over to our coupon page for these sizzling savings! Summer time is FUN time! If you're looking for a few more ideas on how to make it a memorable summer vacation before your kids head off to school, don't miss our kids crafts section on Pinterest! Learn how to make paper plate dream catchers, carousel horses using paper cups, pasta snakes, clever repurposing with baby items, cardboard ball mazes, milk jug crafts, car magnets, a DIY art kit for kids, and much more!